PCM and PCPE issued a joint statement on the occasion of the Spanish PM's visit to Mexico. 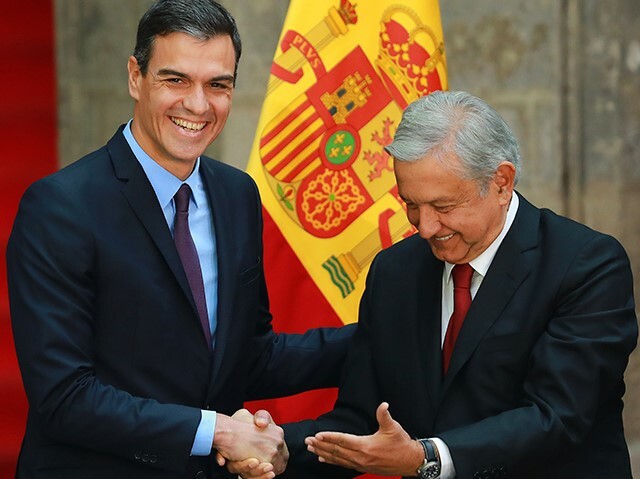 On January 30-31, Spanish Prime Minister Pedro Sánchez Pérez-Castejón made an official visit to Mexico with a delegation including two ministers of his government and a number of Spanish capitalists. The Spanish PM was received by Mexican President Andrés Manuel López Obrador at the National Palace. On the occasion of the visit, the Communist Party of Mexico (PCM) and the Communist Party of the Peoples of Spain (PCPE) issued a joint statement. The statement begins by claiming that imperialism has entered a particularly dangerous stage and continues by exposing the bourgeois character of the Spanish and Mexican governments. It is declared that the collaboration between the two governments does not express the interests of Mexican and Spanish working class, but confirms instead the true nature of old and new social-democracies with their key role for the survival of capitalist exploitation at the expense of the working class. As to the ongoing coup d'état attempt in Venezuela, the two Parties reiterate their internationalist solidarity with the Venezuelan working class and with the Communist Party of Venezuela (PCV). "The Communist Party of Mexico and the Communist Party of the Peoples of Spain will increase their already close revolutionary collaboration before the decisive struggles that are to come. The future will be socialist-communist. Workers of the world, unite!" See the link for full text in Spanish and English.